Get an in-depth look at the unstable climates of New York’s 334 housing projects, told not by sensationalists, but by the individuals with intimate knowledge of these forgotten, helpless environments. For a generation, tabloids, television, and Hollywood have defined the public image of New Yorkers who live in the city’s 334 housing projects. Focusing on crime, disrepair, and other ills that afflict these islands of red brick, such portrayals ironically have made it all too easy for government to reduce the support these projects have relied on since their birth some eighty years ago. And so conditions worsen further yet, as the buildings try to soldier on past their useful life, at times crumbling around the 400,000+ tenants. What if these New Yorkers had the tools and training to document their own lives? And the opportunity to share the result? 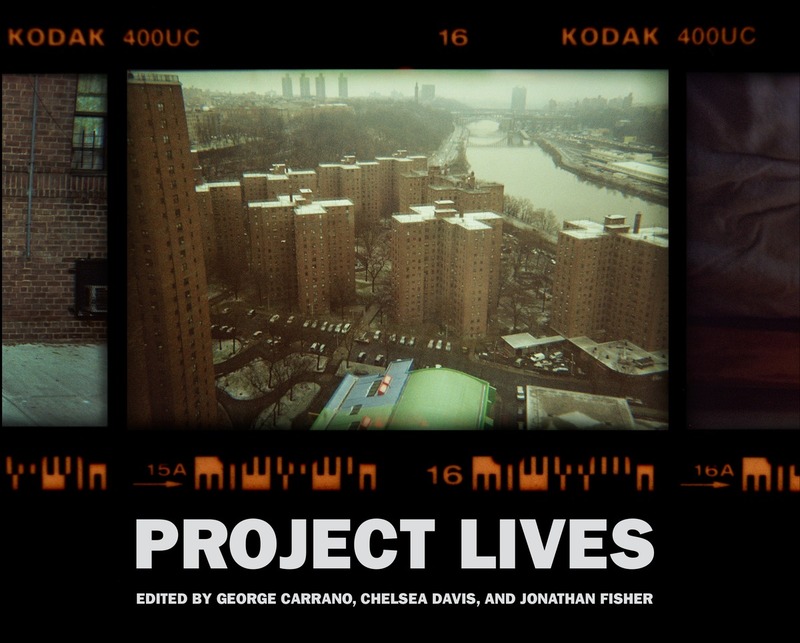 Project Lives takes you on a remarkable journey into a world turned inside out, where the camera’s subject becomes the storyteller. Participatory photography—of which this collection marks one of the largest efforts anywhere—approaches a new visual medium, a universal language speaking across borders and cultures. By using their single-use film cameras as a window into the heart of the projects and a creative instrument of hope, the courageous souls who set out on a daunting mission—to change how their neighbors, friends, relations, and very lives are viewed by America—may accomplish more than helping preserve their homes. George Carrano, Chelsea Davis, and Jonathan Fisher bring you a unique experience of a city within a city. All royalties from the sale of this book will be donated to resident programs at the New York City Housing Authority. A Bronx native, George Carrano founded the non-profit Seeing for Ourselves, which brought the Developing Lives photography program to New York’s housing authority in 2010. He has also curated exhibits of war photojournalism and participatory photography that The New York Times termed “poignant” and “not to be missed.” Previously, Carrano raised the bar for public transit at the Metropolitan Transportation Authority, inventing passenger displays that became the industry standard; leading the agency to just-in-time logistics; and implementing MetroCard — this last a $2 billion subway token replacement whose success awed New York and has remained one of the largest public works projects in U.S. transportation history, universally judged a city milestone. A born Brooklynite with family roots in New York public housing, photographer and teacher Chelsea Davis helped create and directed the Developing Lives photography program at the New York City Housing Authority. She had earlier created a participatory art class for the city’s Association for Metro-Area Autistic Children (2004). Building on its success, Chelsea established the Project Picasso program three years later in the pediatric oncology ward of St. Louis Children’s Hospital, providing art therapy to young children struggling with cancer. The program continues to operate. Born in Manhattan and raised in the Bronx and Queens, Jonathan Fisher administered the Developing Lives photography program at the New York City Housing Authority, managing its extension into award-winning video. Trained in transportation science, he made his mark at the city’s transit agency by producing products likewise award-winning that delighted millions of passengers. Fisher also handled technology communications within Madison Avenue’s Ogilvy & Mather, communicating best practices to 10,000 advertising practitioners in 104 countries. Meanwhile, he has produced highly regarded web, video, and collateral for Agent Orange relief.